Whitesnake are currently on their world tour with stadium appearances across the US and Latin America. 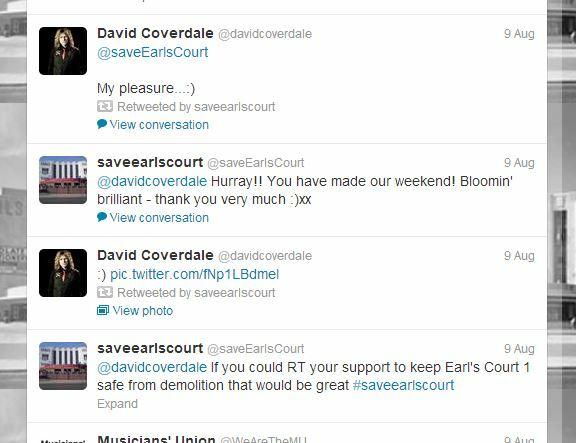 Legendary lead singer/songwriter David Coverdale took time out though to tweet his support for the Save Earl's Court campaign and to swap pics with artist Duggie Fields. 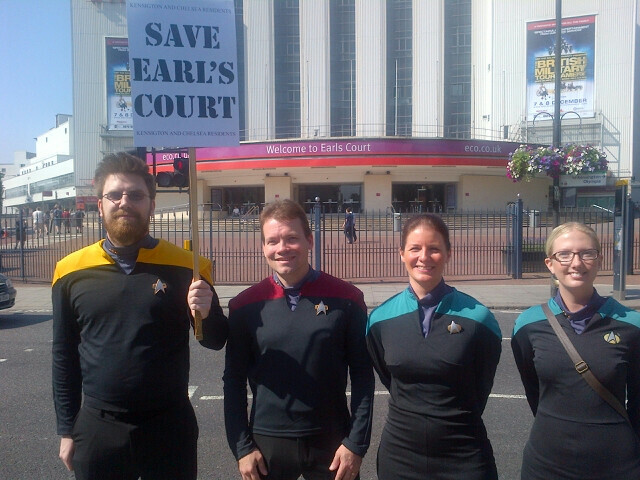 The London Film and Comic Convention 7th July 2013 held at Earl's Court Two was an opportunity for us to meet film, sci-fi and comic book fans who signed our petition in support of saving Earl's Court from demolition. 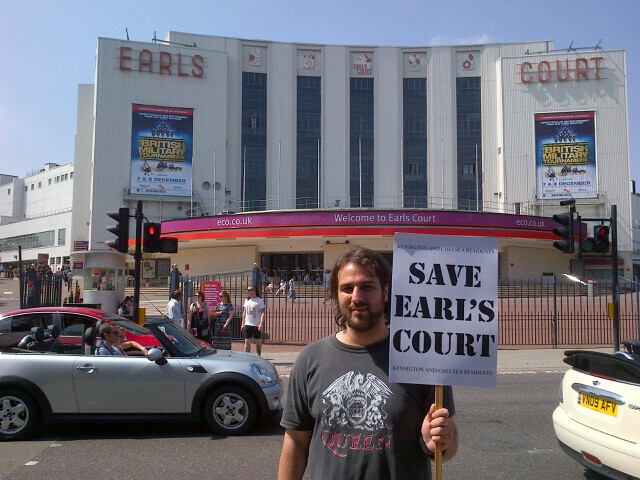 Marc Almond the well known English singer-songwriter and musician has lent his support to our campaign to SAVE EARLS COURT. He has lived in London for over 30 years and in an interview in 2010 he said; "The London I love seems to be disappearing every day. For all its faults, it is the greatest city. and have a look at his web site too ! 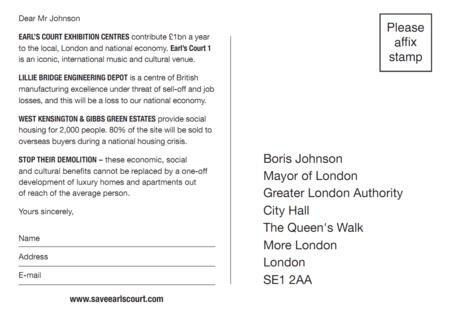 London Assembly Member Darren Johnson AM has written to Boris Johnson(1) urging him to direct refusal to the Earl’s Court redevelopment proposals granted planning permission by the London Borough of Hammersmith and Fulham and Royal Borough of Kensington and Chelsea. The planning application is due to be referred to the Mayor of London for a decision. 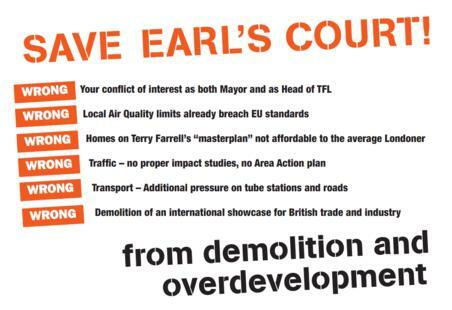 Undermine the local and wider economy from the loss of the Earl’s Court Exhibition centres, damaging both London’s and the UK’s world leading role in the exhibition and events industry. 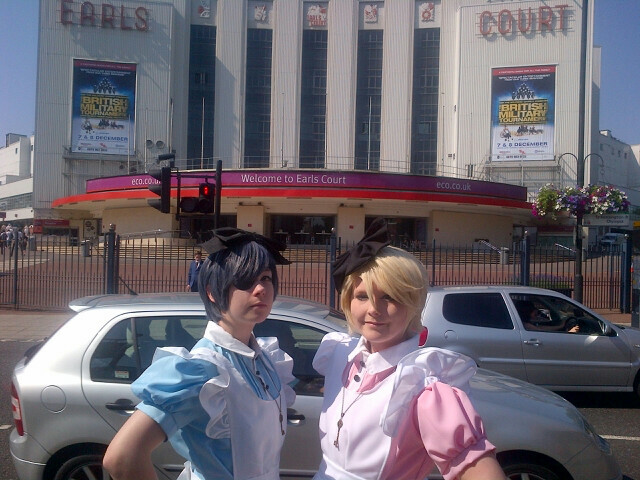 Result in the loss of a national institution which hosts top events, exhibitions and major concerts. Result in the loss of exhibition space and lead to London losing out to competitor nations as they subsidise, expand their event and exhibition space whilst London is already short of exhibition space for national and international events. 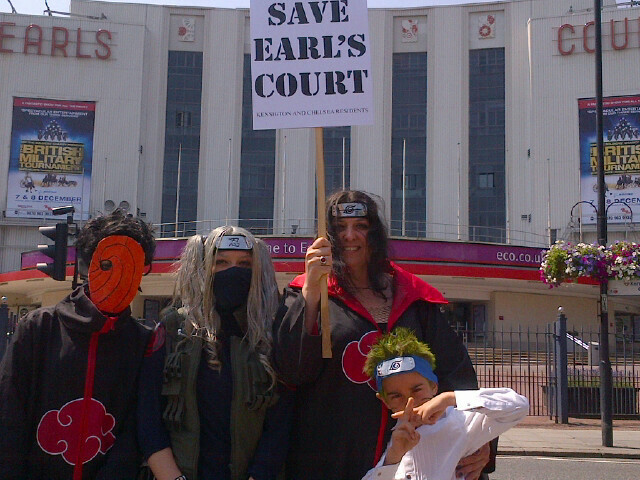 Excel and Olympia are not a suitable alternative for most of the Earl’s Court shows. Result in significant loss of jobs. 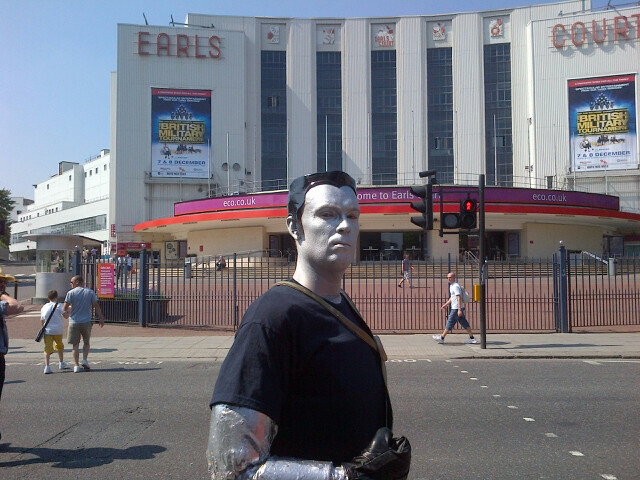 From people employed at The Earl’s Court Exhibition centres and the thousands of jobs it sustains; the Lille Bridge Depot which employs upto 550 people; and the removal of the global mannequin manufacturer Rootstein, from its market. Result in the destruction of an iconic building which is part of our cultural and musical heritage. Lead to further deterioration of local air quality and breaches of legal limits. Result in the unnecessary demolition of the West Kensington and Gibbs Green Estate which consists of 760 homes, with disruption to the area for 20 years. 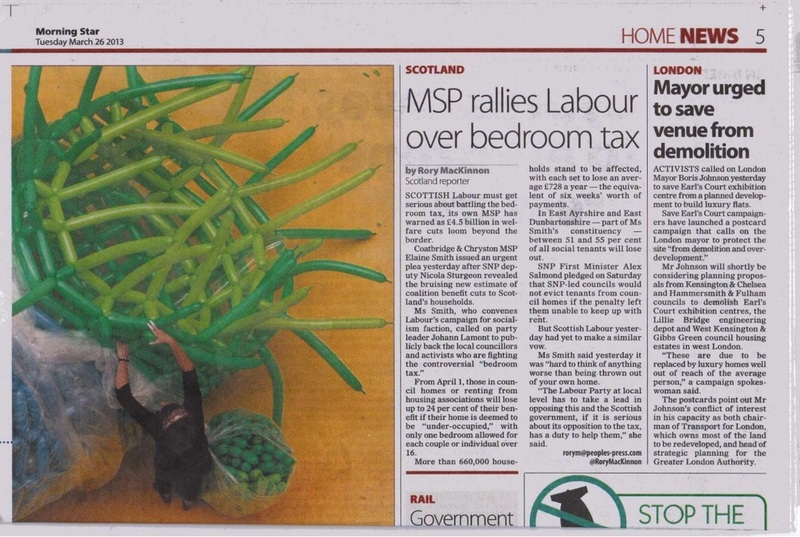 Provide an inadequate provision of affordable/social housing to meet existing and future demand. Result in an inadequate provision of green and open space and play areas. Result in loss of special needs school and inadequate secondary school provision. 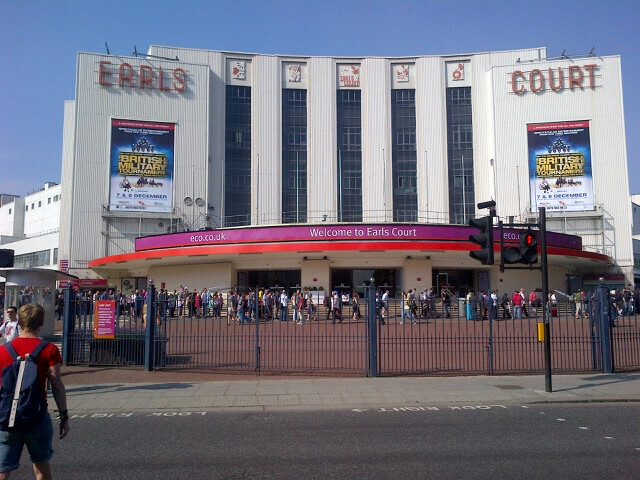 Earl’s Court is a hugely important, successful and established international exhibition venue that brings in two and a half million visitors, thirty thousand exhibitors, hundreds of events and over a billion pounds a year to London. Benefiting from a central London location, close to the West End and convenient for Heathrow it attracts business from all over the globe and plays a key role in the growth of the expanding exhibition and events industry and our export economy. Its strong identity, distinctive townscape, a range of heritage assets and good transport links also draws in significant trade and revenue into the local area. 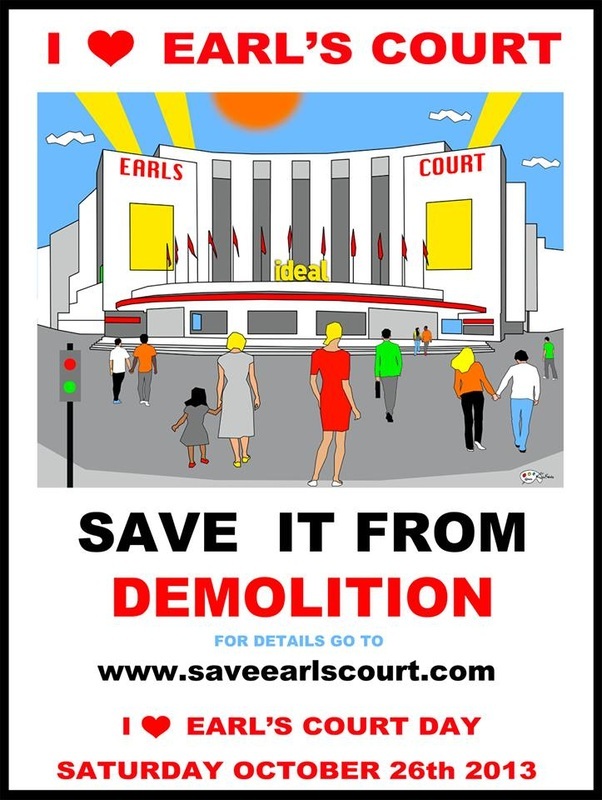 The demolition of this important national icon will be detrimental to the local and wider economy and contrary to the London Plan, Policy 4.1d which supports and promotes the distinctive and crucial contribution to London’s economic success made by central London and its specialist clusters of economic activity. As well as contrary to London Plan, Policy 4.5 which supports London’s visitor infrastructure. The loss of a national institution which hosts top events, exhibitions and major concerts is contrary to London Plan, Policy 4.6 which supports culture, art and entertainment. The Exhibition Centres plays a key role in delivering the events economy, which at a time of economic recession has expanded by over 18% from £9.3billion to £11billion a year. 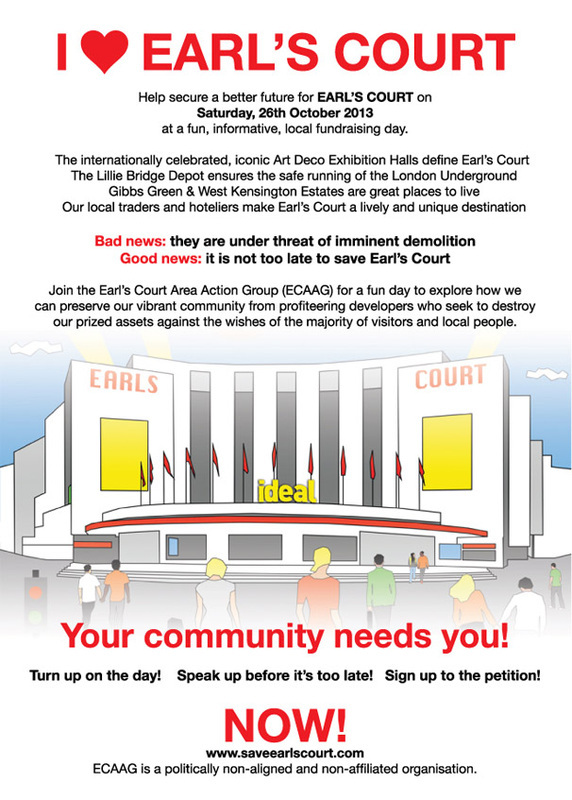 Its loss would relegate the UK’s position as a world leader in the exhibition and events industry as competitor nations are subsidising, not removing venues equivalent in location and status to Earl’s Court. The Association of Event Organisers (AEO) report that London is already short of exhibition space for national and international events and the UK is losing revenue and trade to other countries. This will also remove one of the main exhibition venues in the capital that are suitable for mid-range consumer events that showcase UK businesses and trades. Olympia is not large enough despite its recent upgrade and tubes only service the station from 10.00am on the days that exhibitions are running. According AEO East London’s Excel is not suitable for most of the Earl’s Court shows and cite examples such as the Boat Show that transferred to Excel and lost visitors. 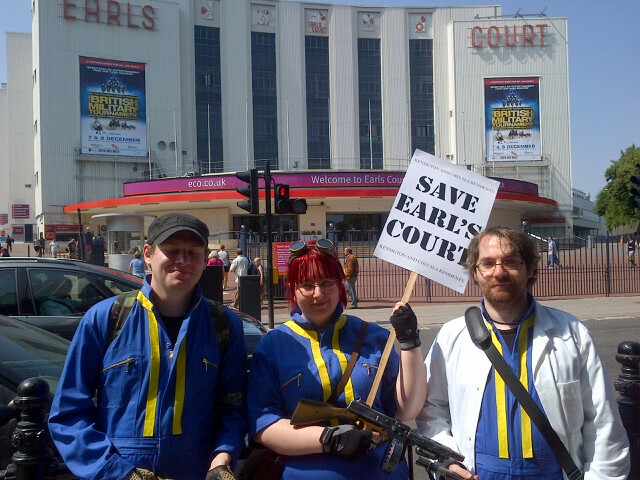 Others were forced, by popular demand to return to Earls Court. Local businesses will be affected by the loss of exhibitors and the two and a half million visitors to the Exhibition Centre. Without any substantial replacement retail, leisure and other amenities existing businesses will close down without the flow of Exhibition Centre visitors. This will undermine the Mayor’s economic development policies of promoting London as the world capital for business, as the world’s top international visitor destination, and a competitive business environment. Paragraph 4.9 in Mayor’s London Plan. The closure of the Lillie Bridge Depot, which employs upto 550 people and manufactures track components bespoke to London Underground (as well as components to Network Rail and other railways), will not only lead to the loss of a skilled workforce and employment, but the loss of a cost effective resource that meets London Underground’s unique requirements. An unacceptable low provision of affordable homes and contrary to London Plan, Policy 3.8 on housing choice and access to genuine affordable housing. Separate to this, 740 residential units will be intermediate affordable homes, the balance being for the open market financially beyond the reach of the average working Londoner. The Royal Borough of Kensington & Chelsea application area already has no provision of affordable rented accommodation, no keyworker, first time buyer, or homes for the elderly within the Registered Provider sector. In Hammersmith & Fulham there is no additional affordable social rented housing. The proposal will lead to further deterioration of existing poor air quality and is contrary to London Plan, Policy 7.14c which states that developments should be at least ‘air quality neutral’ and not lead to further deterioration of existing poor air quality. The Junction of Cromwell/Warwick Road and Earls Court already breach legal limits on Particulates and Nitrogen Dioxide. The addition of 4,300 parking spaces will lead to further traffic movement and congestion and lead to further deterioration of local air quality. The area cannot function without the completion of the entire site. 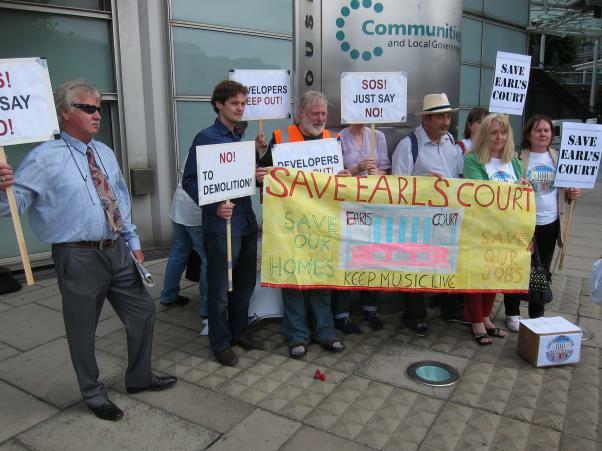 There is the fear that the developers will build the high-end blocks in Royal Borough of Kensington & Chelsea and fail to complete the London Borough of Hammersmith & Fulham part of the Opportunity Area, leaving the RBKC section landlocked, creating additional pressure on the Earl’s Court One-Way System with consequential increases in pollution. The provision of open and green space is inadequate and contrary to London Plan Policy 7.18. The proposals is also contrary to London Plan, Policy 3.6 with inadequate provision of children and young people’s play and informal recreation facilities. The scheme will destroy a special needs school on Gibbs Green and a younger children’s facility on Lillie Road. Despite the increase in population there is no additional Secondary School provision, given the shortage of school places for this age group in both boroughs. This is contrary to London Plan, Policy 3.18 on education facilities and ensuring there is an adequate provision of education facilities to meet the demands of a growing and changing population. For the reasons set out above, I strongly urge you to direct refusal.